A man tried to burn himself near the Kaaba in Makkah, Thanks to the active security officials and the pilgrims who stopped and arrested him on the spot. Police officers, pilgrims and worshipers spotted a man who went to lit himself near to the Kaaba by pouring some liquid material on himself. People formed a circle around him till officers took him outside. - Social media circulating the rumors as that man is trying to burn the Kaaba instead of himself, Major Sameh denied the report and said he is only trying to harm himself. - The accused person seems to be mentally ill and his age is in between 40's , this incident was happened on Monday from that time itself it reached to various social media networks. 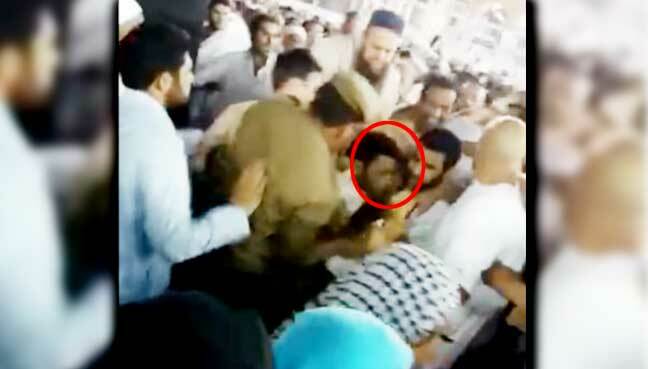 - Watch the below video of incident, Which is circulating on various social media networks, You can able to see some bottle and the security officials arresting the accused near the Kaaba in Makkah.